Are you nervous, anxious or worried about dental treatment? The team at Pembroke Dental Ballsbridge understands that many people are apprehensive about dental treatment. Some people fear the sound of the drill or injections in the mouth, while others have an unspecified fear that they just can’t explain. Rest assured, you’re not alone — in fact, a fear of the dentist is very common. The good news is, we can help. Do I Have Dental Phobia or Dental Anxiety? As we have mentioned, dental phobia and anxiety are hardly uncommon. If you’re trying to determine whether you fit the bill, check out the questions below. If you can answer “yes” to most or all of them, it’s likely you have a dental phobia. Have you avoided necessary dental medical treatment as a result of a fear of the dentist’s chair? Have you dealt with pain, discomfort or even an oral infection for a given period because you can’t face going to your dentist? Does the mere idea of going to the dentist fill you with dread? When you hear, or think about, the sound of a dental drill, can you feel your body reacting in an anxious way (increased heart rate and sweating)? Have you had a difficult experience with the dentist as a child? If this all sounds familiar, read on to see how sedation dentistry can help. Sedation dentistry (sometimes referred to as “sleep dentistry”) is a means of alleviating anxiety in the dentist’s chair. Dental sedation is for people who generally avoid a dental visit like the plague, and can be used for anything from tooth cleaning to tooth extractions. The method of sedation used often depends on the severity of the fear and the type of dental procedure being undertaken. Oral sedation — Oral sedation can range from minimal to moderate. Oral sedation comes in the form of benzodiazepine. Benzodiazepine will make you drowsy, but you will remain awake and conscious. If you require a larger dose than the average person, you might become so groggy that you fall asleep, but you will be able to be woken up with a gentle shake. IV sedation — This sedative drug is administered through a vein, meaning it gets to work more quickly. Using this method, your dentist will be able to continually adjust your level of sedation during your treatment. Inhaled sedation — This is a method of sedation you might be more familiar with. 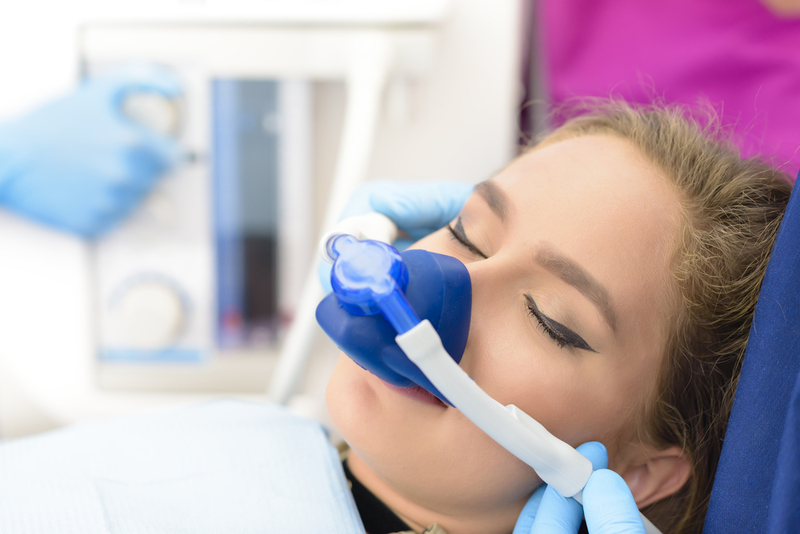 Sometimes known as “laughing gas”, this form of sedation combines nitrous oxide and oxygen, which is administered through a mask placed over the nose. The gas wears off quickly, so you won’t have to worry about feeling drowsy after your procedure. Deep sedation and general anaesthesia — This involves using medication that will cause you to be either almost or totally unconscious during your dental procedure. To wake you up, the dentist will either wait for the effects to wear off or reverse them with medication. At Pembroke Dental Ballsbridge, we offer oral sedation and conscious (IV) sedation, which reduce anxiety levels and ensure a positive dental experience. Oral sedation dentistry is available for most forms of dental treatment, including fillings and extractions. This process requires the administration of a mild oral sedative to facilitate the procedure. All our dentists provide this type of sedation. Our oral sedation process involves a mild sedative, benzodiazepine, which is taken 45 minutes before the procedure. The sedative is designed to act quickly and relieve feelings of nervousness and panic. Everyone is different, so it’s impossible to say exactly how you will respond to the sedative. You might feel refreshed and calm after the procedure, or you might be left feeling slightly groggy. You may also fall asleep during treatment, which could mean you have little to no recollection of treatment. We recommend arranging transport following your sedation, as you won’t be in a fully competent state to drive. Conscious (IV) sedation dentistry is available for larger treatments, such as implant placement and wisdom teeth extraction. Under IV sedation, you will feel deeply relaxed, but you will still be able to comprehend and follow requests from your dentist. This form of treatment is ideal for patients wanting to avoid the noise and vibration of the drill. We’ll insert a very thin plastic tube into a vein in either your arm or in the back of your hand. We’ll then inject a fast-acting drug, which will make you feel relaxed and drowsy. You will be attached to a finger monitor throughout the process so we can monitor your oxygen levels and your pulse. Following the administration of this drug, you’ll be given a local anaesthetic in the form of an injection into the gums, so you won’t feel the treatment. This procedure will make you feel instantly calmer, sleepier and more relaxed. You’ll be less aware of the procedure — making this a perfect option if you’re concerned about dental pain — and sedation usually causes partial or total memory loss of your dental treatment. Some of the effects of sedation can be felt for up to 12 hours, so you will need to be driven or escorted home. At home, don’t use machinery or drink alcohol until the effects have completely passed. Who Might Need Dental Sedation? Dental sedation is most appropriate for people with a dental phobia or anxiety that prevents them from going to the dentist. Need to have a large amount of dental work completed in one sitting. At Pembroke Dental Ballsbridge, our team has a special interest in helping patients with dental anxiety. All our dentists are trained in specific behavioural techniques to alleviate dental anxiety and phobia, and we can provide dental sedation services to those who are particularly nervous. Our expert consultant oral surgeon Dr Eimear McHugh is a trained and certified provider of this treatment. Whatever your particular and unique needs, we are here to help you. Get in touch today to REQUEST A CONSULTATION to discuss your needs. If you’re a nervous patient, we will take the time to talk you through our sedation services and put you at ease.